Here is a commissioned map by Iserlohn on Ah.com about an alternate Philippines. This time, the Spanish manage to avoid the Spanish-American War and thus manage to hang on to parts of the Philippines, particularly around Iloilo and the Visayas while Luzon goes independent. Germany also, as can be seen, gets a piece of the action as the Philippines are divided up into smaller nation-states. 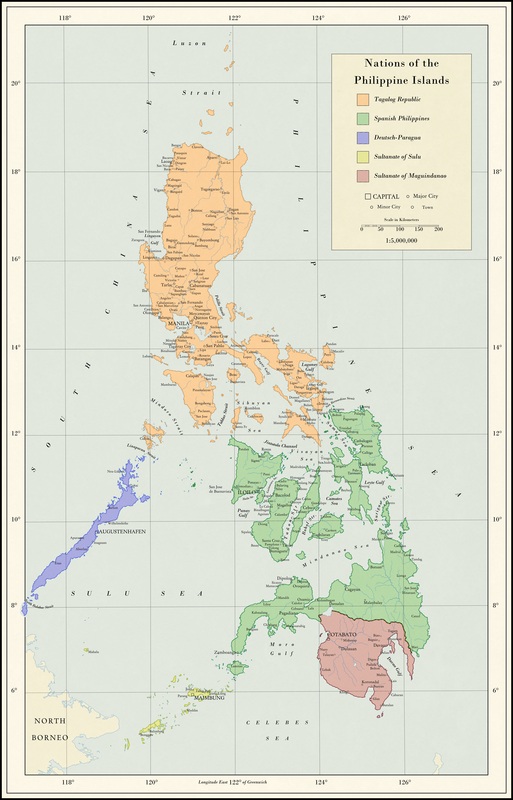 The map is set in the early 20th century as the islands have stabilized, with Spanish control over their portion solidified, the Tagalog Republic strong and in control over Luzon, and the other states stabilized and unlikely to break apart at the moment. While Spain is, in this scenario, unlikely to be incredibly strong, even just keeping a part of the Philippines may be enough to give them a political and economic boost going into the 20th century, though they'll have to fight to keep that boost from hungry European powers and the Tagalog Republic alike. As always, commissions are open, or if you would rather donate and get a chance for a free request map, you can become a patron on my Patreon.